If you’re looking for a sturdy and spacious kennel for you dog, whether you are indoors or out, then perhaps you may want to take a gander at the Adventek Pet Gazebo. With this kennel, you can keep them secure without worrying if they have enough room to move and stretch. In this review, we are going to talk a little more about the features of the Advantek Pet Gazebo Modular Outdoor Dog Kennel, but we are also going to give you an overview of what people who have purchased the kennel had to say about their overall experience with it. Then, we’re going to give you our recommendation on whether or not this kennel is something you should consider purchasing for your own backyard! This pet gazebo is made from a sturdy steel metal that has a powder-coated finish. The powder coating makes the gazebo durable and resistant to rusting, which makes it the perfect option for outdoor use. The kennel is easy to set up and take down, so if you wanted to take your pets with you while you are camping or at a family function, you can keep your dogs in this easy to set up and take down kennel. If you ever worry about your dog getting rained on or that they are exposed to too much sunlight, then you can put up the weather-resistant gazebo cover. 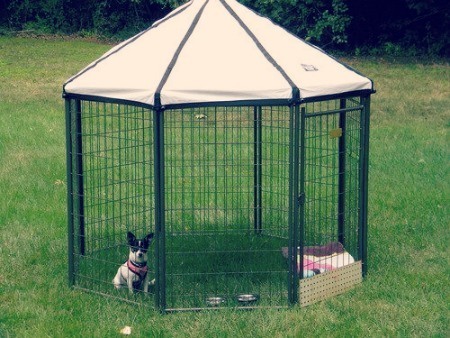 This cover will protect your pups from the weather while being contained in the gazebo. The kennel is available in three sizes—small (48” x 48” x 48” | 50 pounds or less), medium (60” x 60”x 60” | 100 pounds or less), and large (90” x 90” x 90” | 180 pounds or less). If you want more space for your pup to run around in, you can attach several kennels together easily without purchasing extra pieces. In order to put the kennel together, you can follow the easy to read instructions. Even if you’re assembling the kennel on your own, you can have it fully assembled in less than 30 minutes! Not bad, right? When looking at what people had to say about the Advantek Pet Gazebo Modular Outdoor Dog Kennel, the majority of customers were very happy with their purchase. These folks felt that there was ample space in the kennel for large (over 100 pounds) dogs with room to spare. 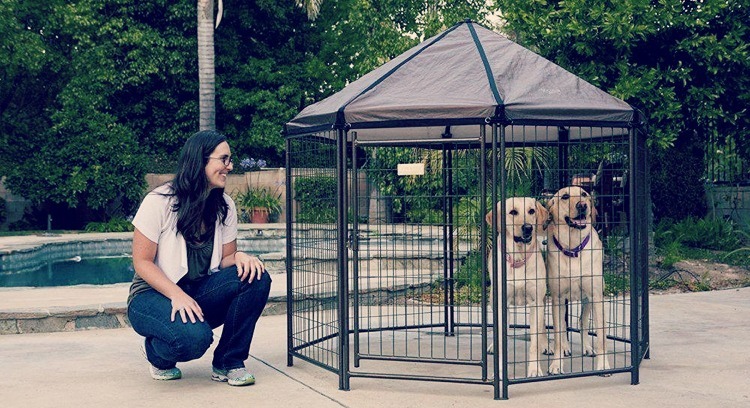 Some people have said that they purchased two of these gazebos to give their pet a little more space, and they felt that two medium sized kennels offered their pet quite a bit of space. When asked to compare this kennel to other portable kennels, these customers were blown away by how solid the construction is. They like that the bungee loops that hold the cover in place feels strong enough to use regularly. One person said that they have a destructive dog that goes in the kennel, and they were pleasantly surprised that the kennel was able to keep the dog inside, even though they used chicken wire under the kennel to prevent them from digging their way out. Naturally, with every good, there will be some bad. There were a small group of people who had problems with the kennel. Some felt that the gap at the bottom of the door was much too wide. Because of this wide gap, dogs could get their head stuck underneath of the door, which poses as a serious danger of strangulation. Customers were not happy about spending nearly $190 to have to make modifications to make the unit safe for their pups. Other customers mentioned some other modifications that they needed to make in order for the kennel to contain their dogs. Like the chicken wire, customers with dogs who like to dig had to put some kind of flooring under the kennel to prevent them from digging their way out. Other customers had to put something in front of the door to prevent the dogs from opening the door. Another customer recommended that if you’re using the kennel inside, you use some sort of anchor because if you have a strong dog, they could move the kennel all around the room. A dog kennel is one of the easiest ways to give your dog a great outdoor life if you don’t have a fenced in yard. With this kennel from Advantek, you can take it down and take it with you when you go on camping trips, family outings to the park, or the beach and erect it with great ease. 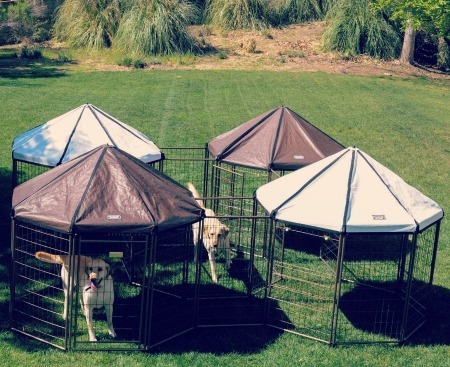 You even have the ability to connect more than one gazebo together if you want to give your pet more space to move. We like this kennel because it gives you that chance to create a nice outdoor space for your dog. The cover has reflective white panels that will deflect the sunlight, helping to keep your pup cool while outdoors. 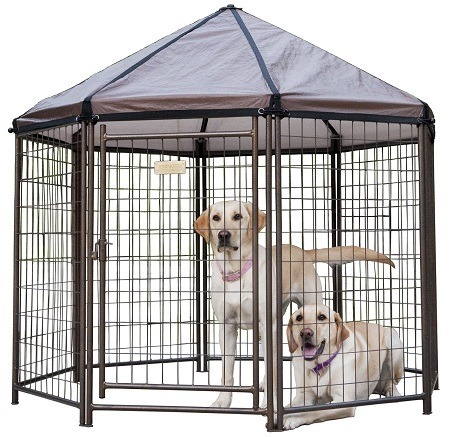 It is worth noting that this kennel is a little on the expensive side, as it is priced slightly under $190. However, when it comes to keeping your dog happy and safe, we think this is a reasonable price to pay. Not only is it reasonable, but the sheer fact that it is portable, easy to assemble, and can be taken with you is reason enough to give this kennel some consideration before you purchase anything.